Caveat to these exercises – not all low back pain is created equally. That being said certain exercises, stretches, and even positions are indicated for some problems where they are advised against for others. If any of the following exercises cause an increase in your low back pain you should stop it immediately. A comfortable “stretching” sensation is great; pain is definitely not. If your back is too painful to handle these stretches please contact us immediately. We would love to consult with you and recommend specific exercises that are tailored to your exact needs. All stretches should be held for 20 seconds and repeated 3 times per session. For maximum benefit perform sessions 2-3 times daily. 1. 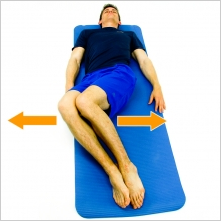 Lumbar rotation stretch – A great way to alleviate tension in your lower back and up through your hips. Lay on your back with both knees bent. Drop both your knees down to the left side until a comfortable stretch is felt in your back and right hip. Hold 20 seconds and repeat to the right side. 2. Hamstring stretch – Tight hamstrings can pull excessively on your hips and throw off the mechanics of your movement. Stretch them out as follows: lay on your back with your left leg out straight. With a belt/towel/rope/sheet around your right foot, pull your right leg up towards the ceiling until a comfortable stretch is felt in your right hamstring. Repeat on the left. 3. Single-knee-to-chest stretch – One of my favorites for pain that is felt in the lower low back / glutes area. Lay on your back with your left leg out straight. Bend your right leg and pull your knee into your chest until you feel a stretch in your right hip/lower back area. Repeat on the left. 4. Piriformis stretch – There’s a muscle that sits deep to your glutes that’s called you prifiormis. I don’t know what it is about that little bugger, but 9 patients out of 10 with low back pain will have a tight piriformis. Stretch it as follows: lay on your back with both knees bent. Cross your right ankle over your left knee. Reach down and grab your left thigh behind your left knee and pull your left leg up to your left shoulder. You should feel this stretch/pull deep in the back of your right hip. Repeat on the left. 5. Prayer stretch / Child’s pose – A great stretch for the entire spine. Kneel on all fours. Keep your hands stationary as you sit on your heels. Pull your chin into your chest. You should feel a stretch throughout your spine from your neck and upper back all the way down through your lumbar spine. These are 5 of my favorite stretches for low back pain. If you’re experiencing a lot of tension/stiffness in your lumbar spine and surrounding areas give these a try – most of my patients have really good success with them!